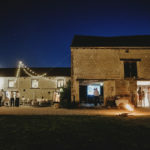 The ‘Bergerie’ – a 120 sqm former sheep barn – fully renovated and transformed into a true multifunctional event space. 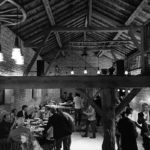 The authentic atmosphere is emphasized using old elements like bed structures, feeder boxes, ladders, old windows and oak beams. 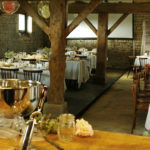 It can now be used for receptions, dinners and parties. 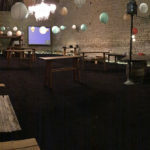 With a bar, dance floor, audio installation, beamer and different tables, anything is possible! A range of table settings, we can create a cosy dinner space for 50 to 100 people. 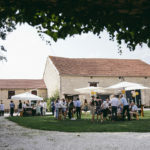 Good weather permits us to create the most romantic outside setting in front of the Bergerie. 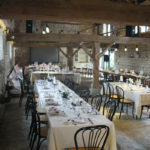 The ‘Grange’ easily is the biggest barn, with 400 sqm of accessible floor space. The impressing hanging roof construction is a decor of its own. Perfect for special events or a reception in less fortunate weather.